How to Use an Airlock? The benefit of using an airlock is that this type of lids keeps the air, dust, and foreign debris from getting into the jar, while letting carbon dioxide generated in the fermentation process escape. A typical airlock is comprised of four parts (a): a lid, a tube, an inner cap, and a top cap (small holes can be found on the top cap to allow carbon dioxide escape). 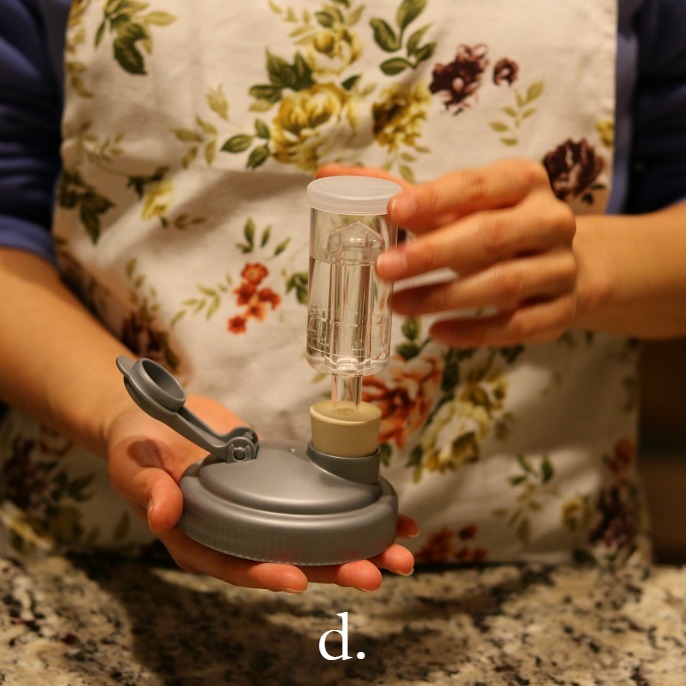 To assemble an airlock, first fit the tube onto the lid (a); carefully pour filtered water in till it reaches the line marked on the tube and make sure you do not let water go into the inner tube (b); next, add the inner cap (c); at last, cover the tube with a top cap (d). You can then use the airlock to seal the jar.